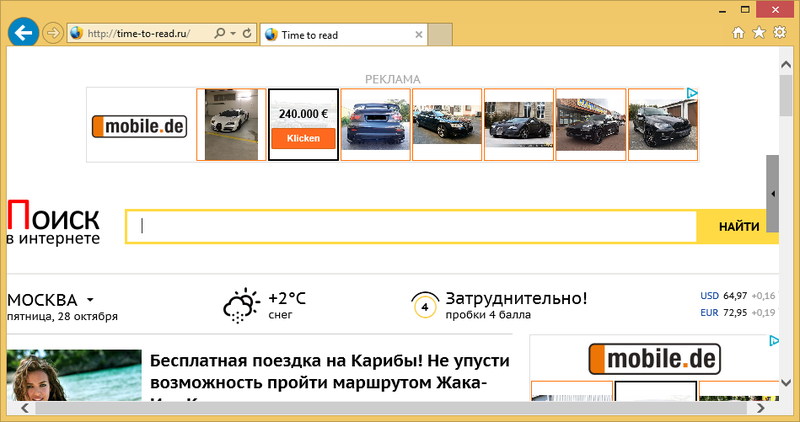 Time-to-read.ru is a browser hijacker used to advertise its sponsor sites. The main goal of the hijacker is to generate web traffic, and it employs various tactics in order to do so. It modifies browser settings, causes redirects, inserts ads into your favorite sites, and so on. The hijacker is compatible with all popular web browsers, so you will not be able to avoid its effects. There is nothing beneficial about this program and you have no reason to tolerate the inconveniences that it causes. We suggest that you get rid of Time-to-read.ru as soon as you can. Once the hijacker enters your system it changes your browser settings. Your home page and default search provider get replaced with Time-to-read.ru. The site is presented in Arabic. It contains lots of links that are divided into various categories such as Video, Games, Sport, Economy, Weather, and more. It also has several unreliable advertisements that should not be clicked on. If you click anywhere on the page, a pop-up ad will appear on your screen. If you make use of the search engine, you will also be presented with sponsored content. You cannot trust the commercial data brought to you by the hijacker, because it is not endorsed by it. You could be exposed to virtual scams that could lead you to accidentally installing malware onto your PC, sharing your personal details with unreliable sources, and so on. If you want to improve your online security level, you should terminate Time-to-read.ru without hesitation. Before you eliminate Time-to-read.ru you should know how you acquired the hijacker in the first place. It does not have an official site, where it could be downloaded. Instead, it travels bundled with freeware and shareware. If you are not attentive enough during the installation process, you allow potentially unwanted programs to get access to your system. You should not let that happen again. Always choose Advanced installation mode and deselect all applications that are unfamiliar to you. In order to remove Time-to-read.ru from your browsers, you will have to get rid of its associated program first. This can be done manually or automatically. If you choose to delete Time-to-read.ru manually, you can use the instructions in the removal guide below. This guide can also help you reset your browser settings after you erase Time-to-read.ru related application. Alternatively, you can implement the anti-malware tool WiperSoft (FREE Scan) provided on our site and let it clean your PC. Not only will it terminate Time-to-read.ru and other potential threats, but it will also protect your computer from future infections you may catch online.